(Big Sandy, Mont.) - U.S. 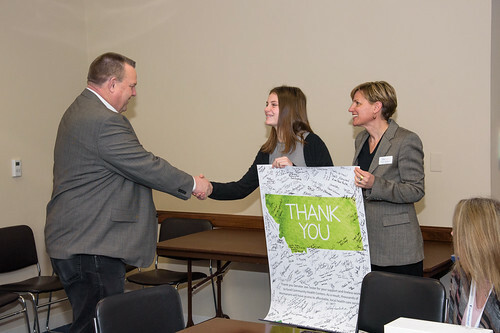 Senator Jon Tester is being recognized as a national champion for community health centers and an advocate for Montana's patients and medical professionals. The National Association of Community Health Centers presented the Community Health Champion Award to Tester on Capitol Hill with representatives from Montana's community health centers in Billings, Bozeman, Butte, Great Falls, Hardin, Havre, Helena, Kalispell, Libby, and Missoula. "From Bullhook in Havre to RiverStone in Billings, Montana's community health centers provide affordable and quality health care to folks across our state," said Tester. "It is a true honor to receive this award. Throughout my time in the U.S. Senate, I have fought for lower health care costs and stood up to demand that Washington prioritize access to health care in rural America." Montana is home to about 40 community health centers that serve more than 100,000 patients each year. Federal funding for them expired in September 2017 and lapsed until February 2018 when Tester was able to broker a deal to secure two years' worth of funding. "Thanks to your consistent vigilance and steadfast support, every American who looks to a health center for cost-effective, high quality preventitve and primary health care can rest assured that their care will continue," wrote Tom Van Coverden, President and CEO of the National Association of Community Health Centers, to Senator Tester. "Your leadership in support of America's health centers was key to the resolution of our immediate funding crisis. On behalf of our nation's community health centers and the 27 million Americans they serve I want to personally thank you." Tester is the only member of Montana's congressional delegation who voted in support of community health centers earlier this year. If Tester had not secured funding in the February budget deal, clinics across the country would have seen a 70 percent drop in federal grant funding, forcing many to cut services, lay off medical professionals, or consider closing altogether. Tester votes for the Affordable Care Act, which establishes the Community Health Center Fund. Tester joins bipartisan Community Health Center Caucus. Tester supports two-year extension of Community Health Center funding. Tester uses the Community Health Center Fund to secure more than $7 million in grant funding for Montana Community Health Centers. Tester hosts health care listening session in Helena with local Community Health Center leaders. Tester hosts health care listening session in Havre with local Community Health Center leaders. Tester hosts health care listening session in Missoula with local Community Health Center leaders. Tester hosts health care listening session in Billings with local Community Health Center leaders. Tester hosts health care listening session in Bozeman with local Community Health Center leaders. Tester calls on Congress to take action and reauthorize Community Health Center funding before it expires in September. Tester uses his position on the Senate Appropriations Committee to secure $1 million in additional funding for Community Health Centers in September, but that bill is not brought up for a final vote by Majority Leader Mitch McConnell. Failed Congressional leadership allows Community Health Center funding to expire. Tester cosponsors bipartisan CHIME Act to reauthorize funding for Community Health Centers. Tester opposes short-term budget that doesn't contain Community Health Center funding. Tester scolds colleagues on the Senate floor and demands Community Health Center funding is included in a long-term budget bill. Tester again takes to Senate floor saying "Enough is enough" and calls for budget agreement to include Community Health Center funding. Tester again opposes short-term budget that doesn't contain Community Health Center funding. Tester sends letter to Congressional leaders demanding Congress include Community Health Center funding in upcoming budget bill. Tester, on the Senate floor, keeps heat turned up on colleagues to reauthorize Community Health Center funding after a report sheds light on consequences of Congress' failures to fund Community Health Centers. Tester sends another letter to Congressional leaders demanding they take action to fund CHCs. Tester hosts press conference on Capitol Steps with Community Health Center leaders, urging Congress to reauthorize Community Health Center funding. Tester secures two years of funding for Community Health Centers in a bipartisan budget deal.